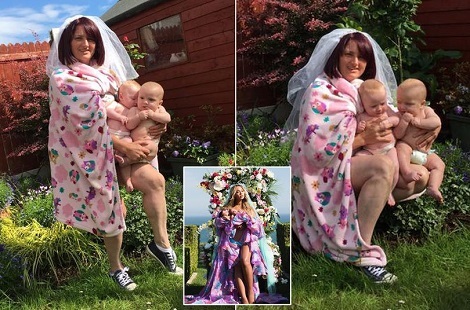 A Cork mother has replicated Beyoncé's latest photoshoot, in which the star unveils her newborn babies to an expectant world. "Surrounded by a wall of ornate flowers, and with the ocean stretched out behind her, Beyonce looks positively ethereal," our coverage reads. It was on yesterday that Beyoncé shared her latest picture. She's hold her two twins, Sir Carter and Rumi. The snap, one month since her son and second daughter were born, follows Beyoncé's surreal pregnancy shots. Mum Sharon Kellaway had twins back in February – also a boy and a girl. She decided to strike a similar pose to Beyoncé for a floral photoshoot of her own. Mirror Online asked Sharon a bit about it: "I had a few spare minutes yesterday when I saw Beyoncé photo online. When my six-year-old came in, I grabbed a veil from her dress up box and a pink baby blanket and she snapped the shot. I sent it to my friend Sinead in Canada, who said post it. "It was just random ... 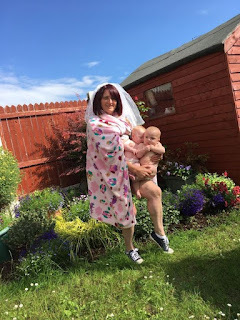 I have the twins, the blanket and the veil, a few home-grown flowers in a the garden ... I had what she had, so why not? Thought my friends would get a giggle ... didn't expect it to go this far!